Italian writer; born at Rome, 1825; died February 12, 1897. He was educated in the Talmud Torah of his native city, and graduated as rabbi, but never held any office. 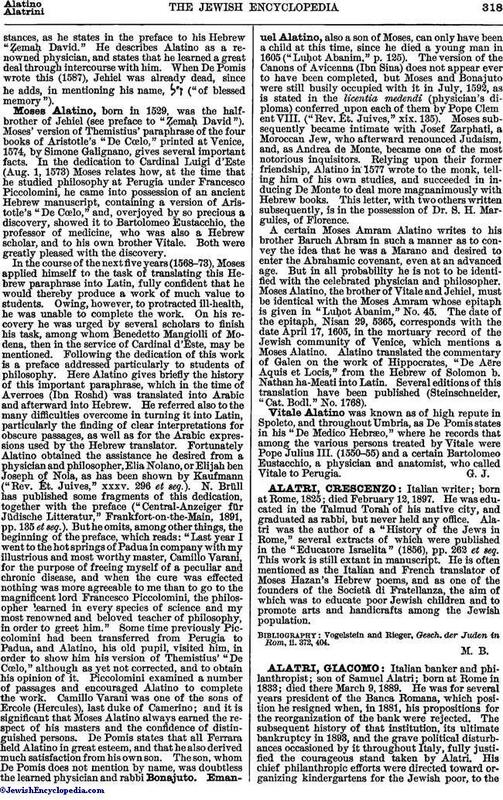 Alatri was the author of a "History of the Jews in Rome," several extracts of which were published in the "Educatore Israelita" (1856), pp. 262 et seq. This work is still extant in manuscript. He is often mentioned as the Italian and French translator of Moses Hazan's Hebrew poems, and as one of the founders of the Società di Fratellanza, the aim of which was to educate poor Jewish children and to promote arts and handicrafts among the Jewish population. Vogelstein and Rieger, Gesch. der Juden in Rom, ii. 372, 404.